Czech & Speake founder, Frank Sawkins, coined the name Edwardian, for the most successful and iconic range of bathroom fitting and accessories. This period in British history relates to the short reign of Edward V11, Queen Victoria’s son, however the Edwardian period is not about the King’s famed decadence, but the zenith of the British Empire and Industrial Revolution of the prior century bringing together craftsmanship and new technologies of the early 20th century, which realised the neoclassical style in furniture and architecture, lavish Ocean liners, plus the emerging motor car and aeroplane industries. A hay day for stylised design, of great simplicity and staying power. The core of the range hasn’t changed much for over 100 years; except improvements in materials using lead-free brass; mechanical improvements valves, diverter mechanism and non-scold thermostats. Unlike contemporary bath fittings, an Edwardian organic shape is fully exposed leaving little room for mistake in the finish and can only be hand polished by finest craftsmen. The range is inescapably linked to traditional interiors alongside wood panelling, Turkish carpets, mahogany furniture, plaster cornice and marble. And most projects are for heritage restoration, landmark building and traditional style interiors. However, some of the world’s most famous contemporary architects and designers have used the Edwardian range in the most minimalist modern interiors. 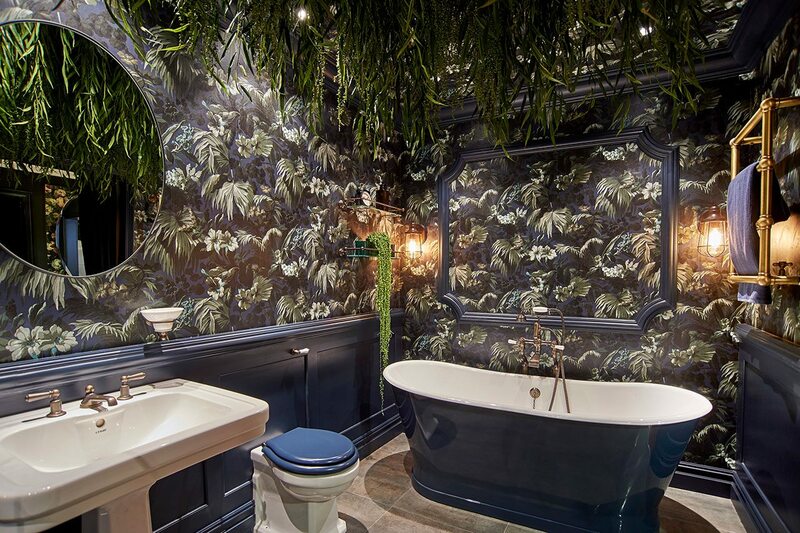 Here are some of the ways you can turn your bathroom space into an Edwardian sanctuary. The Edwardian period was a time of optimism. For King Edward VII, it was a rebellion against his mother’s tight rule and a chance to take pride in the country. The wealthy, upper class joined him in an idealistic reinvention of their culture through extensive travel, high fashion, and spending prolific amounts on the interior and architectural design. To channel the wealth and prosperity of this time, don’t cut corners with the details. 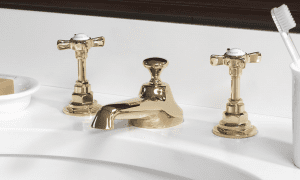 Elevate your basin with striking gold taps, and enhance a freestanding tub with premium fittings. A beautiful bathtub can become the perfect centrepiece for your bathroom, transforming any space into a haven. 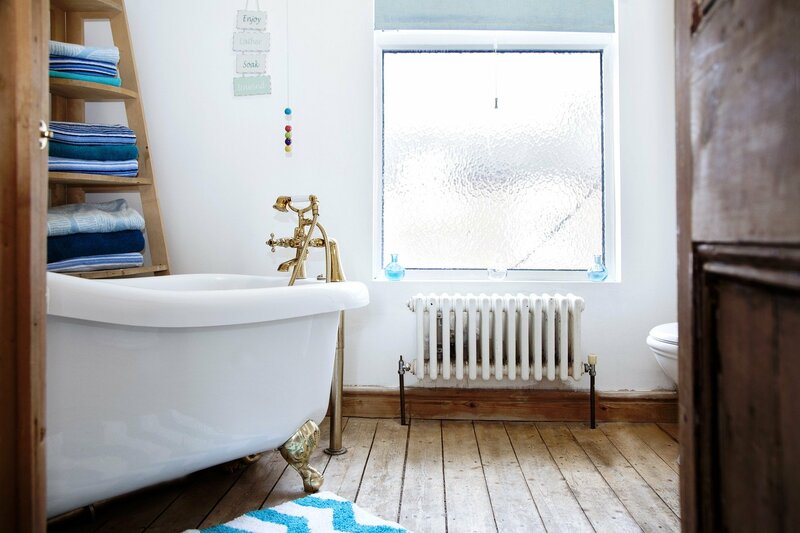 It deserves those little hardware extras, like our Edwardian Deck-Mounted Two-Hole Bath Mixer. paint is often the most practical choice for humid rooms, which bathrooms commonly are. However, wallpaper can add both texture and depth if you have larger square footage and a well-ventilated area to work with. A feature wall can help to create a focal point and add intrigue to an otherwise cold space. Florals, birds, gold foil prints and intricate patterns are synonymous with Edwardian home interiors and are an uncomplicated decorative solution to achieving the period bathroom effect. In terms of colour, the Edwardian era favours a soft colour palette. Think springtime hues that follow the design narrative of bright, clean and fresh. Pastel shades such as duck egg blue, calming lilacs, soft pinks, light floral yellows and subtle greys work particularly well. Finally, contrast with rich mahogany finishes and solid wood bathroom furniture for a vintage look that oozes grandeur. time on the details doesn’t end at bath taps and fittings. The considered design approach should filter down to all bathroom décor, including the smaller finishings such as storage items and toiletries. Antique storage jars or vases can also make a great feature (handy for keeping cotton buds or disposable razors tidy), whilst gold or chrome plant pots can bring out the finishes seen on your bath and basin, lifting them as a key design feature. The bathroom products in this article should aid in providing you with an indulgent bathing experience, to mirror the hedonistic Edwardian lifestyles of the early 20th Century in Great Britain. A sign of a luxury bathroom has a lot to do with the products and fragrances seen on display, so opt for high-end brands and artisan makers. Our luxury bath oils and fine fragrances come in beautiful display bottles, making them ideal to add to the décor of any Edwardian bathroom. We also have a collection of stylish bathroom accessories to aid a quick transformation. 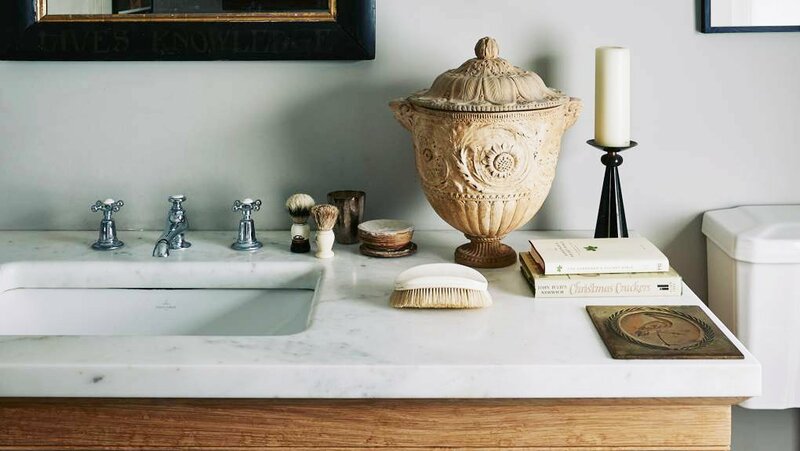 For more inspiration on period bathroom design, take a look at our Edwardian fittings.